Another Nuro test – with a LAN connection. Wow! This is more “knock your socks off” impressive speed. Since my main computer is an iMac, and not portable, I simply connected it with an extra LAN cable (took 5 seconds) and turned off the wi-fi and wow wow wow – download speed of 739.67 Mbps! Upload was 105.91 Mbps. The average seems closer to this test (304 Mbps down, 131.6 up) but still really great I think. 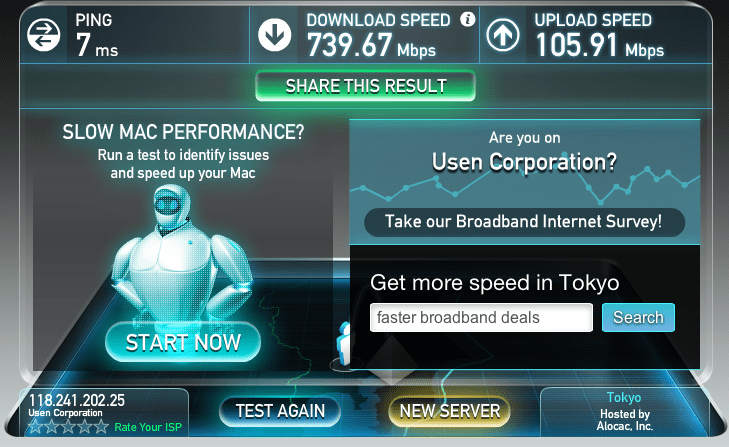 That’s 667 Mbps download and 663.4 Mbps upload!